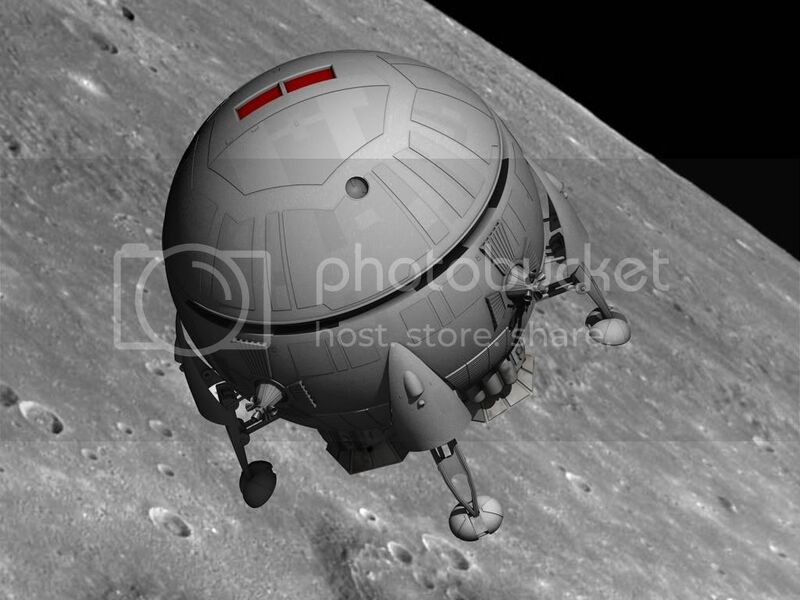 When I first started learning Cinema 4D, the first model I made on my own was the Aries 1B from the classic 1968 movie '2001 - A Space Odyssey'. At the time, I thought my Aries was brilliant (at least in the eyes of a beginner). After looking at japetus' excellent Aries 1B, I thought it was time to revisit my own model through more experienced eyes. I grabbed some screen shots from a Blu-ray version of the movie as well as the book 'Filming the Future' by Piers Bizony. I found many, many inaccuracies in my model when compared to the screen grabs. I also discovered a flaw in the drawings of the Aries in the book when compared to the screen grabs. Since I used the book as my references when I built my Aries a few years ago, my model also has the flaws. For instance, the hatch as shown in the drawings is on the wrong side of the ship when compared to the screen grabs! I am wondering if the filmed model in the movie could have been reversed as some of the detail is in reverse to japetus' model and the master being made at http://spicerstudiosinc.com/spicer-studios-gallery/thumbnails.php?album=107. I hope to correct the flaws and inaccuracies of my model and make it closer to the studio model as depicted in the film. ('2001 is one of my all time favorite movies. So far to-date, I have modeled the Aries, Moonbus, Discovery complete with pod bay interior and cockpit. Started on the space station, but my hard drive got pooched during a power surge and lost the model. Anyway, here is a render of when I made my original model. Time for a quick update. I've been picking away at this as time permits, so things are going a bit slow. Started redoing the top body panels. Found a lot of great photos of the Aries model from Douglas Trumbell's website. It blows me away the kind of detail and accuracy that Kubrik wanted from his employees. Update: Have started working on the panel detail. Having some trouble getting some of the panel details from the studio model, so will have to do some more research. Nicely done. I don't have C4D. Is it possible to post an obj version? Once it is complete, I will post the model here in both C4D and OBJ formats. Update: I wasn't really happy with the panel details. They looked way too heavy. I just redid the panels so they are lighter and more subtle as on the studio model. Good luck Tralfaz! Thanks for the compliments on my model, it turned out to be more complex than I originally thought it would be as I dug into it. I was just actually revisiting mine as well to add a few bevels and chamfer to some parts that I had forgotten about among other things. (Also it's around 5 million polygons which is starting to creating buggy scene files. I think at least half of that is in the passenger area). It's funny you mention the reversed door and other details. I noticed that too and it was really bothering me for a while until I realized that the shot is reversed in the movie! Pretty funny. If you start to do the interior of the Aries you will notice that there isn't enough room in the designs for the cockpit to fit inside w/o running into the passenger area. In addition there's absolutely no room for the galley you see in the movie either! Kubrick was very exacting, but unfortunately for us that detail got overlooked or ignored. 2001 has been a huge inspiration for me as well. I was looking through old stuff the other day and found my old space station from the movie that I had modeled way back in...2001 or '02 not sure. I too was toying with the idea of doing the Moonbus. Thanks Japetus. Not yet sure about an interior or not. I was thinking about the galley and perhaps it is underneath the passenger cabin and not above it. Wait, that can't be right because the flight attendant gets on the round walkway and goes up to the cockpit. And I don't think that is correct either. If the cockpit is above the passenger compartment, why wouldn't the elevator just go up to the cockpit? Or at least she should walk around 90 degrees and then go up to the cockpit. Crap, it's bed time now and this is going to keep me up all night LOL. I think I am going to go with, it just looked so cool on the screen when I was 13 years old! BTW, the images are great! I already had a lot of them, but you've got some real gems in there. Thanks again. Haha yeah the rotation is wrong too in the movie...really messes with your head. Glad you enjoy the images! Update: I've been working on the body, landing gear and engines lately. Just need a few more touches on the landing gear and retro rocket mounts, then rig it. A while ago, I had downloaded the nurnies and greeble packs from here. They did not import all that great into C4D, so for the ones that I wanted to use here, I redid them in C4D and kept the design pretty close. The engines are not 100% exact, but I think they capture the flavor of the original fairly well.